As we were traveling through Illinois, Missouri, then Oklahoma, I had the feeling of being moved backwards in time. Back to when the west was the ‘wild-wild-west’, when buffalo roamed the range, and hunters, as they looked to find a large herd that would provide food for the winter. I could almost smell the smoke from the firearms as these herds roared by. This feeling was only increased as we made our way into Texas and a little south to Fort Worth. Most of us know about stockyards, but the stockyards in Fort Worth are a little different than most! Oh, they still have the cobbled streets and all the barns with the train tracks going right through the middle, but the difference is what is in the stalls. Not the cattle but shops of all kinds, a restaurant with really good Bar-B-Que and all sorts of goods to be purchased. There’s even a 5-star Hotel, where we spent the night, within walking distance. One of the hi-lites of the trip was at around 11 a.m., when all the townsfolk and visitors lined the streets in anticipation of what was about to happen. We were there as well, with family. 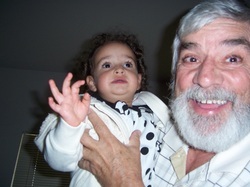 Salma was most interested in airplanes, which held her attention for a while. Salma got to go on her first pony ride. Not so sure at first, but a little more comfortable by the end of the ride. Then here come the commacheros, all dressed in their gear from head to foot, on their horses. From somewhere came the mariachi music, which added to the ambiance. What came next was so amazing to me…a cattle drive! Longhorns and I mean longhorns, being driven down the street in broad daylight by cowboys sitting atop their horses. 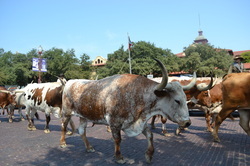 Even some of the cars had longhorns. This was so out of a western movie. Never seen a deer with a rack like these! All this had me wondering what it would be like to do some deer hunting on horseback! 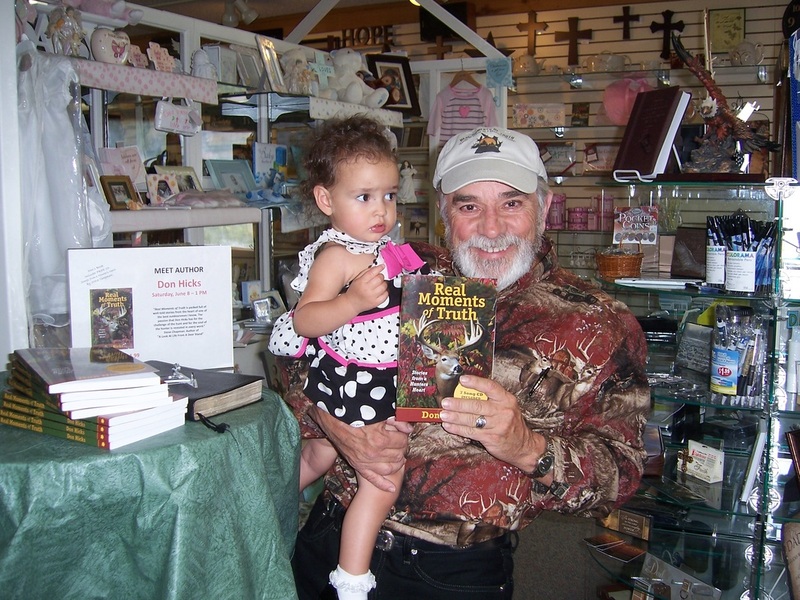 I never seem to wander so far that white-tail hunting is absent from my mind! They seemed to be enjoying the day. 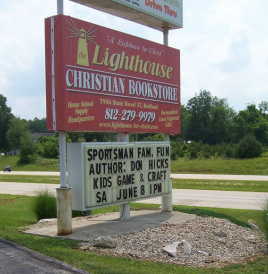 When our daughter was home for a visit in June, I was scheduled for a book signing @ ‘the Lighthouse’ book store in Bedford. She, her husband and daughter dropped in to see what it was all about. These are a couple of photos from the event. to look up in a tree and saw the remains of a rustic tree-stand...that had seen it better days. the story of the deer walking under it that was the brute of a lifetime. that graced its presence, and hear the tales of days gone by. We recently were invited to conduct a revival meeting in southern Mo. fishing pole back and forth to try and snag the fish. requires little effort or energy. could be a noun in this situation. Not so with the spoonbill! suppose He would be referring to the word fishers as an action? Or was He simply pitching out the word as a noun? Are we to be actively pursuing the lost and leading them to Christ? Consider the difference. every time you give a witness, but without a witness, you will probably snag none. that God will answer those prayers.